Okay, first off let me tell you how excited I am to finally be working on my whale art project!! I’ve been wanting to make one for awhile now, but wasn’t exactly sure HOW I was going to make it. I saw this one on Pinterest and fell in LOVE. Well out of the blue, Sharon (from at FloraCraft® Make It: Fun®) contacted me about writing a post using their FloraCraft® Make It: Fun® Foam Sheets. I agreed, and she sent a package my way. 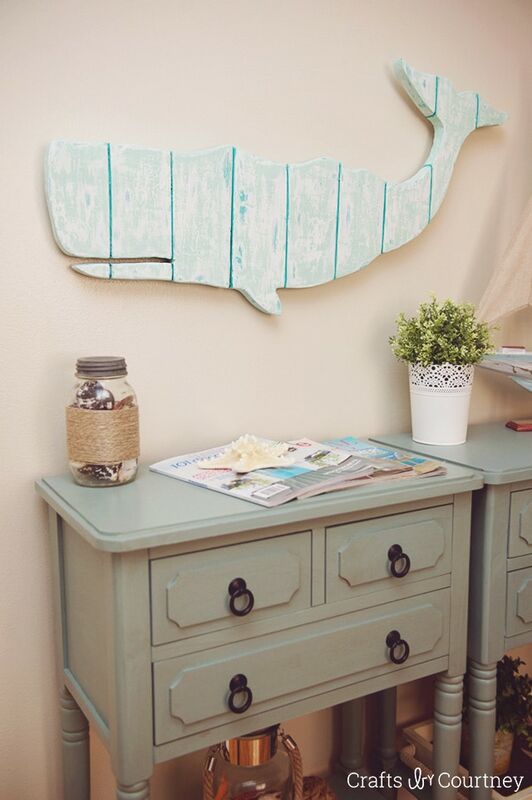 I got it a few days later and was so happy I could make my faux wood whale art (I even did a small, but appropriate happy dance). We are moving into a new house in a few months and it has a beautiful mantle. 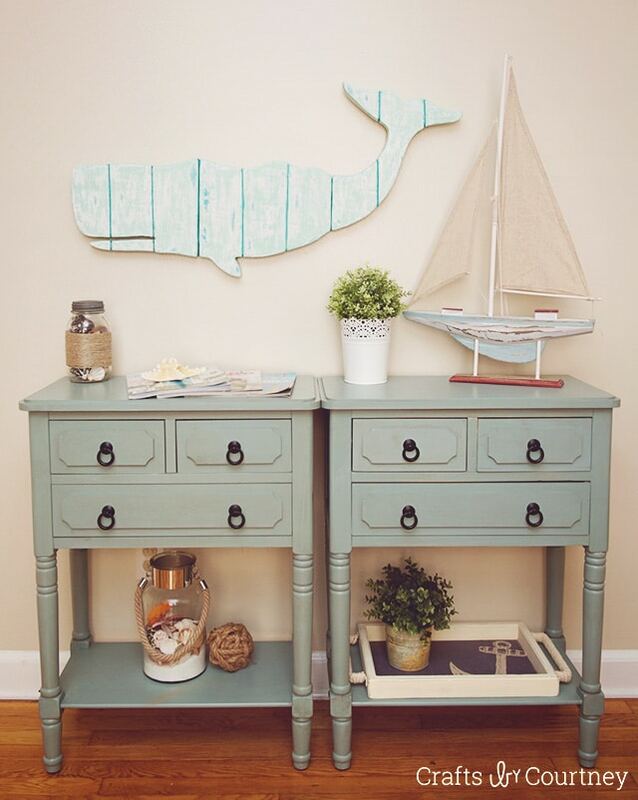 The whale would look perfect above it and totally fit my coastal home decor theme. So, I started experimenting with my paints. I really wanted to give it that aged look with a POP of color. Next, I put my hubby on the task of creating the outline for my whale. He did an awesome job (by the way) creating the free printable whale template. The whale measures 35″ wide and 17″ tall. Now that’s a big whale! I rounded up my chalk paints, sand paper and the rest of my supplies to begin. This truly was a project I couldn’t wait to start! 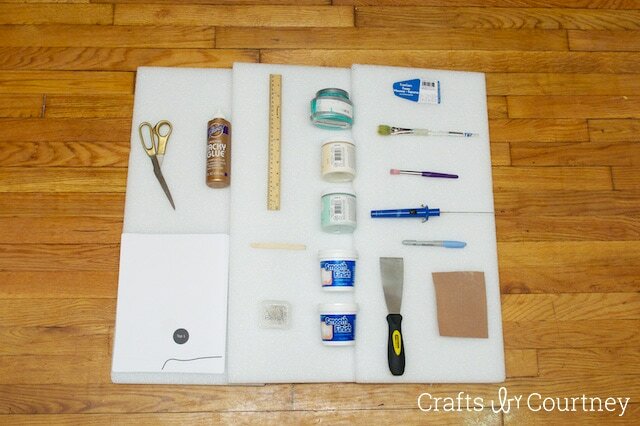 By the way, it’s my first time using FloraCraft® Make It: Fun® Foam Sheets, so I’m pretty excited about this craft. To kick this project off, you’re going to need your whale outline templates printed. Next, cut along the outer edge of each template. When finished cutting, tape your pieces together. Finally, align your whale in the center of your FloraCraft® Make It: Fun® Foam Sheets and pin it down using you push pins. Quick Tip: Take your time with cutting and pinning your whale down. A simple mistake now can be hard to fix later. With your whale template pinned down, carefully trace the outer edge using a permanent marker. When done, remove your push pins and place your whale template aside. Now here’s the fun part, cutting our whale out! First, plugin in your FloraCraft® StyroCutter® Plus tool. Wait 15 seconds for it heat up. Be careful it gets very hot! Next, grab your sheets of FloraCraft® Make It: Fun® Foam and cut along the outer edge of your outlines using a slight sawing motion. Quick Tip: Have someone help hold the FloraCraft® Make It: Fun® Foam when cutting. This will prevent any breaks in the product. To make your faux wood slats, measure out how wide you want them to be (we chose 4″ wide) and mark your FloraCraft® Make It: Fun® Foam Sheet. Then, use a ruler and draw out your wood slat. Finally, take a popsicle stick and slowly saw your slats into the FloraCraft® Make It: Fun® Foam. This part takes patience and attention to detail. Use a ruler to keep your lines straight. To give our whale a smooth surface to paint on, we’re gonna need to add some Smooth Finish putty. So, take a putty knife (or spatula) and add your Smooth Finish to the entire whale (except for the back). Let dry overnight. When dry, sand your whale until it feels smooth. If you have dents or uncovered areas, repeat steps again. To get your slats back, sand down the dry putty where your slats were (in an up-and-down motion). Quick Tip: Having trouble finding your slats? 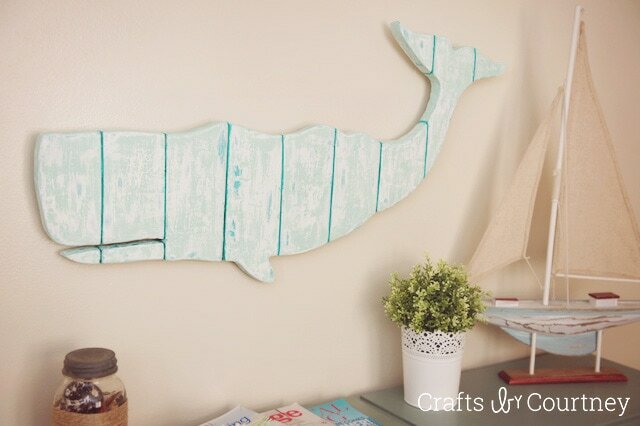 Hold your whale up to the light and mark with a popsicle stick. 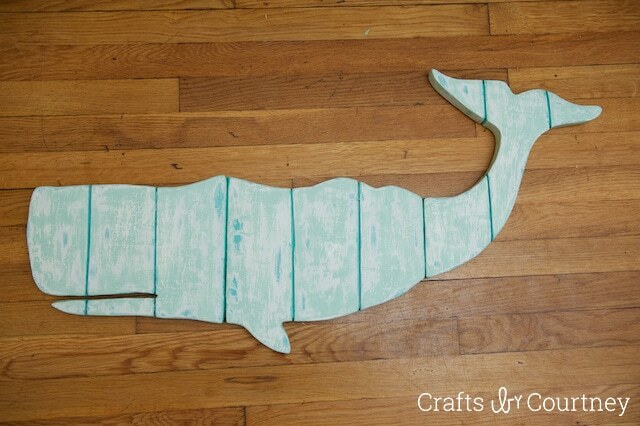 Once sanded, add a coat of your base color (be sure to use something bold) to your whale, but DON’T paint your slats. Let dry 30 minutes. Now, paint a second coat with a lighter paint color. Let dry another 30 minutes. Lastly, add your third and final paint color and let dry for 30 minutes. I almost didn't want to paint over this gorgeous turquoise color. Quick Tip: If you accidentally paint over your slats, just add back your base color using a fine tip brush. If you know me, you know that THIS IS MY FAVORITE PART of crafting…the distressing! And boy did I put a number on this whale! Everyone has different styles, so sand over your painted whale until you’re happy! I just love the dimension that distressing gives. This whale is awesome! With the majority of our work done, now it’s time to make Fred the Whale whole. To do that, cut a thin piece of FloraCraft® Make It: Fun® Foam (the length of your whale) and glue it to the back using craft glue. Let glue dry for an hour. Finally, add a few Command™ Strips to the back of our whale, so we can place it on the wall. Put a nice and even layer of glue on the backside of your whale. Yes! Fred is almost ready for his first swim! BUT first, do you like the look of finishing wax? You can add a single coat over the ENTIRE whale (that’s what we did). Wax not your style? 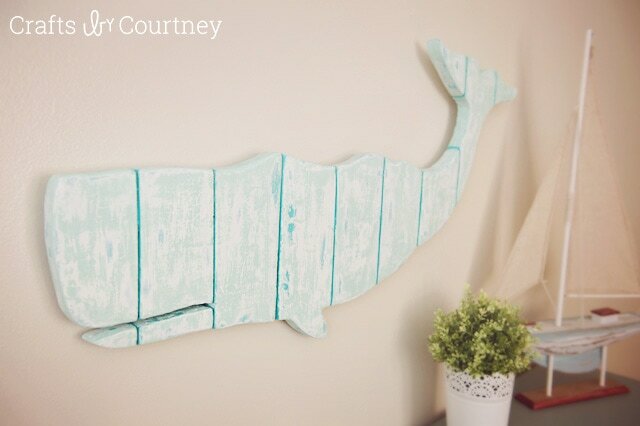 No worries, because our faux wood whale art is complete! Fred the Whale looks gorgeous on the wall. This whale really looks like wood, what do you think? Okay, this project is a wrap! I never thought you could make faux wood wall art using FloraCraft® Make It: Fun® Foam. I am so glad I made this. Fred looks great next to all my other coastal decor. Thanks again to Sharon for providing the materials for this craft. I will definitely use it again. So what did you think? 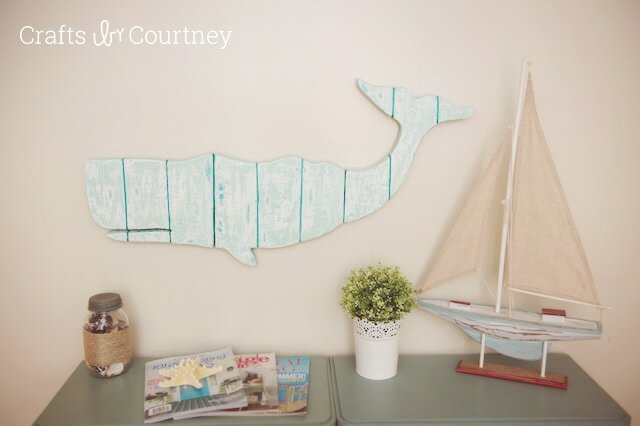 Do you think my whale wall art looks like wood? Have questions? Leave a comment, I love feedback!